Oftentimes I get asked what the stimulus was to create a certain type of dessert. Sometimes it is the season which inspires, I do love seasonal desserts, they fit right and I feel that they have an air of ceremony to them. It can also be a discovery of some sort. I remember very clearly the time I first came across bergamot oil, which ignited my “Bergamot phase”. At that time I must have made a million things using bergamot oil. It is still one of my very favorite aromas. Another basis for creating a dessert can be the simple fact that something is delicious but underused. In that category certainly falls grapefruit. Extraordinary and delicious with an unrivaled aroma would be a terrific way of describing this fruit, especially the Ruby Red. If grapefruit was easy to incorporate it into desserts, it certainly would be used a whole lot more. But that’s where it gets a little more difficult, how to use grapefruit in desserts. Grapefruit is very versatile and is terrific if combined with meringues or in milk chocolate type of applications. Combined with lemons, limes and mandarins it creates a superb flavor medley. 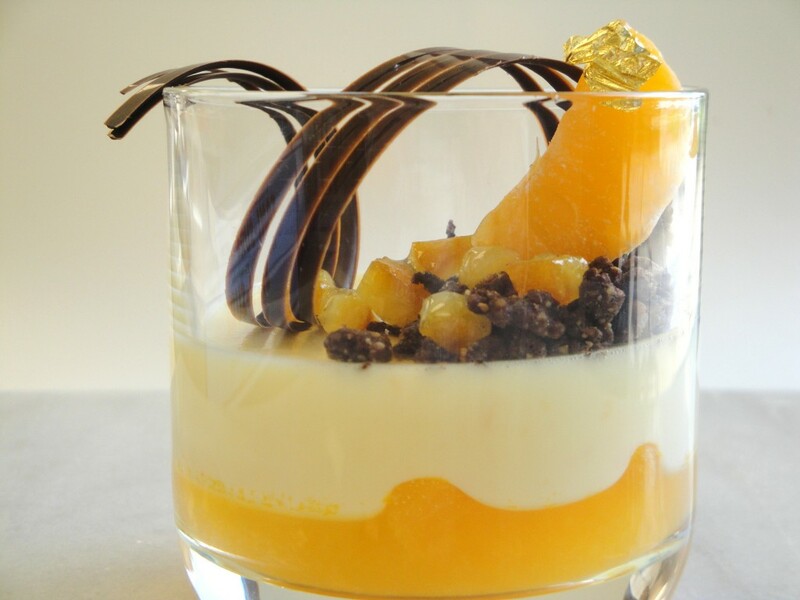 A combination that works especially well in a cremeux, which can be made into a beautiful dessert served in a glass. Good citrus cremeux contains just enough sugar to make the flavors sing and still has a good smack of tartness. Citrus desserts with the right amount of sugar will have high aroma notes and will truly be amazing. Citrus desserts made with not enough sugar will turn our taste buds into “Coping mode”, if too much sugar is used the citrus scent is lost and all what is left is just blah. Preferably make the cremeux the day of serving. Consuming the day it is made will lend the best texture and flavor. The chocolate grapefruit streusel-crumble can be made days ahead and frozen. Defrost and bake when needed. It is also delicious sprinkled on sorbet and gelato. 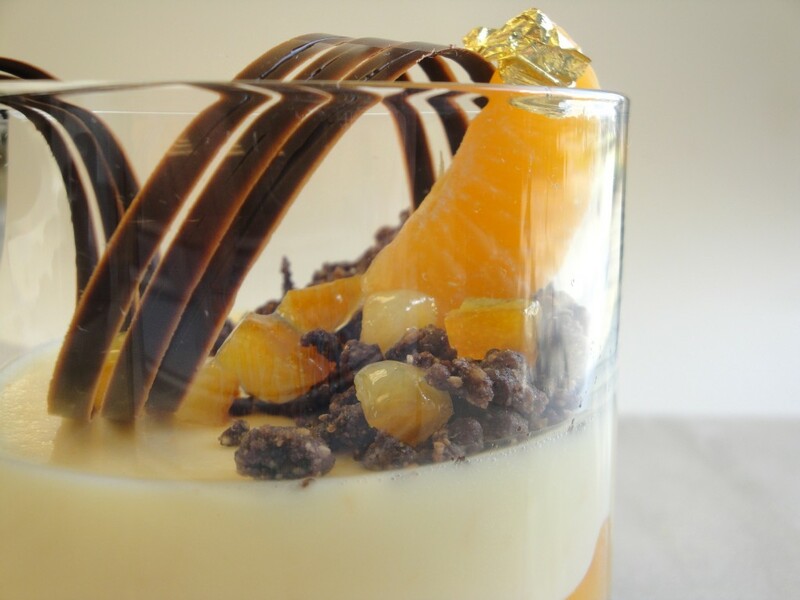 The orange layer on the bottom of the glass is a gelée made of mandarin oranges. If you like to make this as well, start with the gelée and pour this on the bottom of the glass along with some mandarin oranges. Use any type of desired chocolate décor made of tempered chocolate. 1. 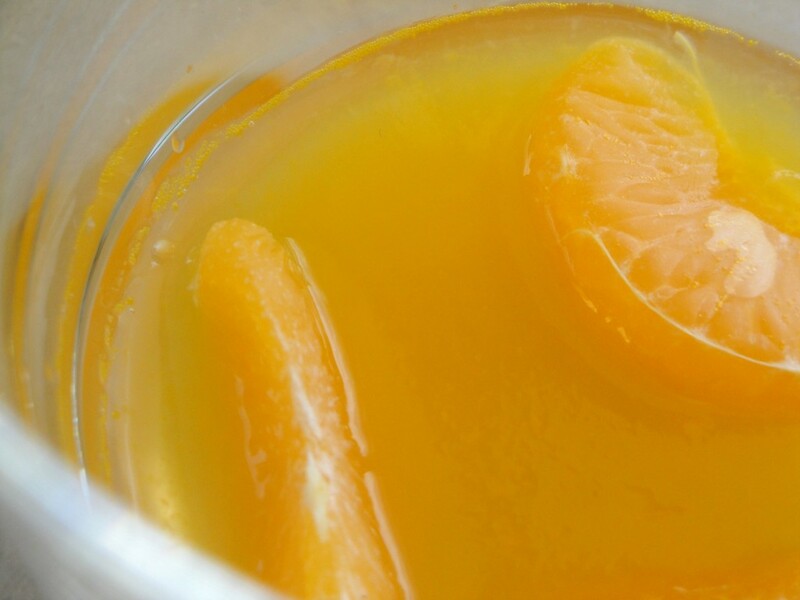 Bring the sugar and mandarin orange juice to a boil in a non reactive saucepan. Remove from heat and let cool below 180°F (80°C). Meanwhile soak the gelatin leaf in ice cold water. Add the pressed and soaked gelatin and combine. Add the Cointreau. 2. 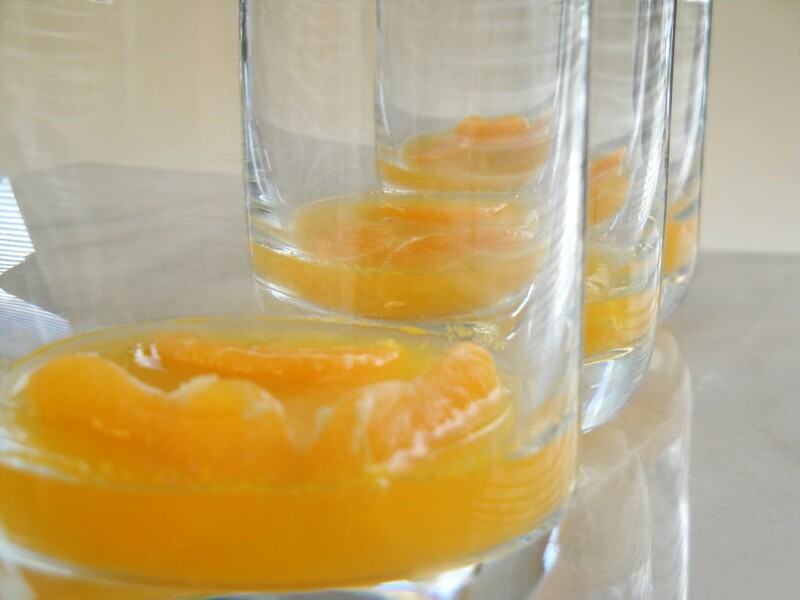 In each glass place 2-3 mandarin orange segments. Evenly cover with the gelée and place in a refrigerator. In a non reactive saucepan bring to a boil the sugar, grapefruit zest, grapefruit juice, lemon juice, lime juice and heavy cream. Remove from heat. In a separate bowl whisk the yolks for 30 seconds. Add one fourth of the boiled mixture to the yolks while whisking rapidly. Pour the tempered yolks into the remaining boiled mixture and while constantly stirring heat to 185°F (83°C). Remove from heat and cover with plastic. Place the gelatin in ice cold water for 5 minutes. Press out excess water and add to the above. Add the liquor. Let the mixture cool until it feels slightly above room temperature. Pour in the glasses and place in a refrigerator. In a bowl combine all the ingredients and mix to a coarse sandy mixture. Bake in a 350°F (175°C) oven until dry and crumbly, about 14-16 minutes. This is making my mouth water! Cannot wait to try this one! Great job Chef Eddy! I agree with you, grapefruit is not used enough in desserts. Several weeks ago I made your chocolate cremeux and it was delicious! This weekend we will make this cremeux for our dinner party. Cheers. I just finished making the cremeux and it is wonderful! Please can you add more chocolate decorations in you upcoming articles? Thanks for posting new style desserts on your site. It seems like so many other sites do nothing more then recycle the same things over and over. p.s. We received the On Baking book and are trilled! OMG this was a hit at our house. Will make this again! Can you show us how to make the chocolate curls? This was great. Very delicious. We made this in our school I go to and everyone loved it. Bergamot oil sounds incredible…I’ve had a hankering for it too, but so far, I’ve only found non-edible versions for candles or soaps. Where would you recommend that I go to get food-grade bergamot oil? I have found food grade bergamot oil at Whole Foods market. Amazing smell! Wow, this dessert is something… Topping off with some chocolate strings. sweet and alsome to look at.